NYC Endangered Species: Is There Life After Delisting? Blue Whales. The Bornean Orangutan. Asian Elephants. All of these animals–and thousands more–are endangered species, and all these wild animals struggle to survive. Whether due to poaching, deforestation, or a constantly changing habitat, a whopping 5,766 endangered species and 3,947 critically endangered species have been put on the 2012 IUCN Red List of Threatened Species. Not all hope is lost, however. With the help of conservation efforts, tightened security against hunters, and funding dedicated to helping protect and promote these species before we lose them forever, progress has been made. And for some species, lives have not only been saved, but entire animal populations have blossomed. The result of all this good news? Species have actually come off the endangered species list. So the next question is: What happens when animals are taken off such a list, or “delisted,” as the process is called? Are animal communities so successful at repopulating a good sign, or a chance to once again be put in jeopardy? Being delisted is a rare event, but contrary to popular belief, the forecast isn’t necessarily good. Decades ago, gray wolves in the U.S. were considered a top predator and hunted nearly to extinction by farmers and ranchers. After a successful campaign that reintroduced the animals less than 20 years ago, gray wolves are now doing so well that they’re about to be completely removed from the federal protection list, leaving any protection cases up to individual states. Not everyone is happy about this decision. Taking a species off the list is often done under pressure from those who are suffering through the animals’ prosperity. Ranchers are pressing for gray wolves to be removed from the endangered species list so that they may kill off the perpetrators, thereby putting us back into the vicious cycle that the U.S. tried to remedy in the first place. In fact, because the reintroduction of wolves has been so successful, there is now a flood of wolves in Wyoming, Montana, and Idaho who are threatening livestock. Hunting gray wolves in these states is encouraged, and proposals in many states aim to reduce each state’s wolf population by lengthening the hunting season each year. It therefore seems logical to assume that the day that grey wolf is removed in several still-fragile Western states, farmers will start killing off wolves again. Will any progress have been made? Then again, delisting species is rarely done so for goodwill or in cases of wild success; instead, business is of the utmost concern. Take Thailand, which decided not to downgrade protection or delist the endangered Siamese and saltwater crocodiles. While only 200 or so exist in the wild, over 200,000 exist in various commercial crocodile farms throughout Thailand. Why? The skin and meat bring in over 4 billion baht (or over $130 million U.S.) each year. So while many countries in the international voting process supported delisting these crocodiles, too many were against it for the proposal to go through. This means that Thailand’s export of crocodile products is blocked for now. Once those numbers in the wild grow steadily and the species are delisted, however, you can bet that both wild and farm-raised crocodiles will be killed at alarming rates. While the country denies that’s the case, we can only hope these animals stay on the endangered species list for many years. From abalone in South Africa to humpback whales in the Pacific, it’s important to remember that more than animals and farmers are effected with the reintroduction of threatened species. In national parks and private lands across the Western U.S., for example, it was apparent that flora and fauna were greatly impacted with the downfall of wolves. Wildlife was gone, there was noticeably less plant life, and even birds rarely frequented many areas. With the reintroduction of just grey wolves, however, everything flourished once again. Landmark studies done over several decades revealed that although farmers complained about wolves killing a few of their livestock, these were the very animals who were also keeping animals like deer in check—the deer who had overgrazed many areas, leading to less brush, fewer berries, and fewer birds. The cycle down to the smallest animal was all put in jeopardy without wolves there to regulate. Perhaps both sides will never be happy with the rulings on endangered species, but one thing is for sure: Without a healthy balance of all plant and animal species, our world can’t operate correctly. From the soil and plants to marine life and more, we need to work together and understand the impact of wild animals in order to understand and restore our planet. Assemblyman Félix Ortiz has never been one to shy away from unpopular issues. Earlier this month, however, he went out on a dangerous limb. In an effort to save New York State from supposed health risks involving the common food ingredient known as salt, he brought into doubt his entire career. Ortiz was the first in his family to move to the U.S. from Puerto Rico. After receiving his Master’s in Public Administration from NYU, he served in the army for two years. Voted into the New York State office in the fall of 1994, the Democrat went to great lengths working for all those in need. Latinos, sweatshop workers, immigrants, and more have benefited from Ortiz. Whether working on fighting childhood obesity, banning cell phone use while driving, or actually lowering the drinking age, Ortiz has always been involved in matters big and small. There wasn’t a problem until just this month, when Ortiz proposed a health bill. Not just any bill, though, but a bill to ban all salt use in any NYC restaurant. For any reason. And with a $1,000 fine for each and every dish using salt, you can bet…wait, why are we even talking about this with as serious matter? The bill is absolutely bogus. Do I support lower salt intake? Yes. Do we consume too much sodium in our diets? Yes. Should restaurants have salt banned? That’s not even a possibility, and it’s a ridiculous point to even attempt to make. 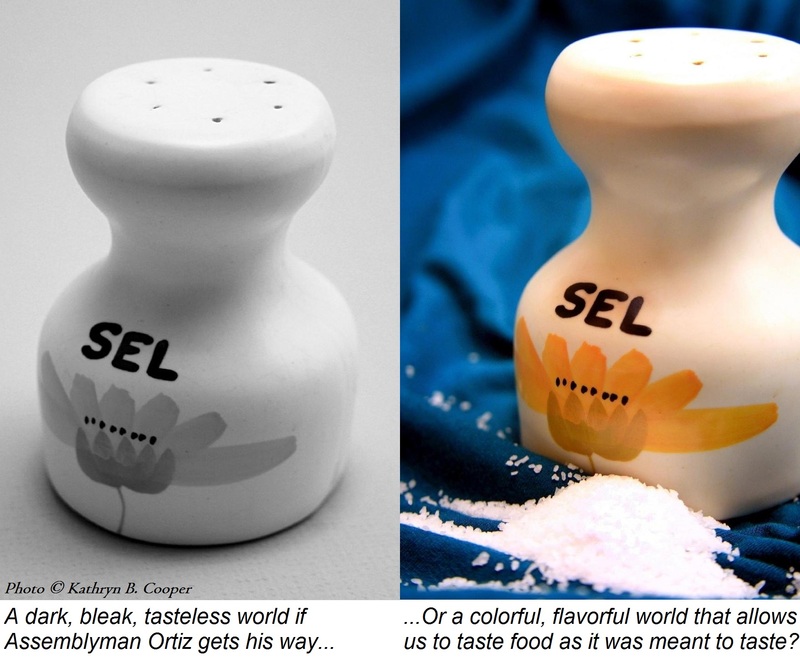 It’s not as if Ortiz made the bill to help lessen the use of salt; no, he created the bill with the explicit intention of having all salt eliminated from every single dish. So what’s the big fuss over salt, you ask? To truly understand the presence of salt in our food, it’s important to recognize what place salt had in our history. While it’s true that many foods don’t naturally contain salt, the fact is that without it, foods are rendered fairly tasteless. Even sweets need salt for both chemical reactions and taste balance. You see, foods are meant to be cooked with salt. If you have a dish with little taste, chances are it just needs a dash of salt. This ingredient actually brings out the true flavors of foods, and no other element can do that. Salt has been used to preserve and add flavor to foods for almost as long as mankind has existed. Lake Natron, in Northern Tanzania, has always been an exemplary source for the important salt trade. Because of evaporation and heat fluctuation, pure salt is naturally left for harvest by the locals. Not just a food seasoning, years ago this commodity was so valuable, it was called “white gold” and actually used as currency in Africa and many parts of the world. Records showing salt use have been dated back thousands of years, while current use brings out flavor and helps preserve. Meats that would spoil quickly were made to last with a salt curing process. Cheeses were given flavor. Asian fish sauce was given its balanced, notorious stink, and virtually every other food benefited from salt throughout history. Despite being overused, salt is one of the most necessary ingredients in food today. Plus, humans wouldn’t be able to function without a balanced level of the stuff in our bodies. Now, of course I realize Ortiz isn’t recommending we stop eating salt, so I’m taking this too far. Or am I? The Times Union out of Albany, NY, was where I first read the ridiculous details of the bill. It stated that while Ortiz himself admitted he’ll keep eating salty foods himself, he also stated that he was proposing the bill in the first place because of his father’s recent high blood pressure and heart attack. This salt ban would save the country billions in health costs. Really? He says this, remember, having done no research at all. Are we to trust this person? And please, anyone who suggests adding salt at the table as a way to make up for cooking with it has absolutely no clue about food, food chemistry, or the process of cooking. What about people not being able to make healthy decisions, you ask? I would argue that while I’m quite aware of many cases where there’s a lack of proper nutrition information, I would also propose that anyone who has the money to dine in a NYC restaurant is probably aware of the general lack of good-for-you food. Good to eat, yes, because most know that restaurant food tastes so darn good because they put heaps more butter and cream in foods than we would ever use ourselves while cooking at home. If you dine out, you’re taking your chances. And there is progress being made in terms of government-led action against bad foods in NYC, if you’re for that. Consider the ban on all trans-fats, or the recent mandatory posting of nutrition facts. But banning salt in this way would not be the same at all; it would be chemically changing and ruining the science of cooking and flavoring. Now if you cook for yourself and don’t know the good from the bad, well, that’s another matter for another time. Perhaps the most important part of the bill, however, is not the absurdity of the bill itself, but in fact what this all says about someone who would propose such a bill. Ortiz admits he did no research before proposing the bill. A person who makes such a bold statement without prior research is bad enough, but a politician? Even if the public often disagrees with what a politician is saying, we at least hope to respect how he or she came to that decision. For a New York State Assemblyman, though, going to the extreme of proposing a bill without any evidence or thought to back it up is simply unacceptable. This isn’t an argument over the left or the right, or the right or the wrong. This comes down to an issue of a politician who made an extremely dumb mistake, and now it’s bringing him the notoriety I’d say he deserves. In the end, it’s not about salt. We know we should cut down. We know the bill was ridiculous. We know he went the tabloid route instead of the smart route. If his goal was to simply bring about awareness, perhaps he should reconsider his abuse of public outcry and get his facts right. And perhaps we should reconsider his legitimacy as a politician. Great chat today! Looking forward to next week! Excellent, that was a fun chat, I really enjoyed it! Great chat and thanks for sharing my iPhone photography! See you next week. One of my favourite chats and some great photos here. Thanks for sharing. Awesome chat. Can’t wait for next week. Big thanks for adding my pic. Congrats on getting the site together! I like what you are doing here, it is nice. You have some great pictures!